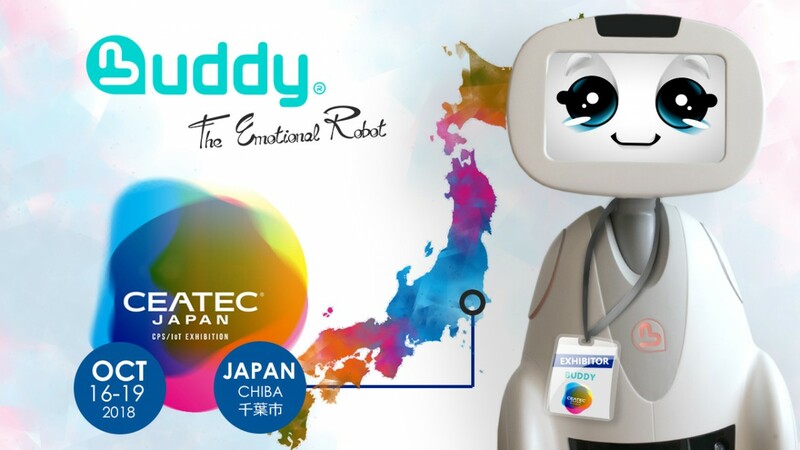 BUDDY, the emotional robot, will be presented for the first time at CEATEC 2018 (Combined Exhibition of Advanced Technologies), one of the largest showcases in Asia for innovations and IoT. It’s “THE” world’s IoT show! This will be an opportunity for Blue Frog Robotics team to preview at the international level its B2B offering “BUDDY Pro” and BUDDY EAIF (Emotional AI Framework). Blue Frog Robotics is one of 4 selected French start-ups (out of 120 startups) by the Ministry of Economy, Trade and Industry Japan (METI) via its IoTLabGlobal Connection program. This high-tech event will take place from October 16th to 19th at the Makuhari Messe International Convention Complex in Japan. It brings together the biggest manufacturers, in very varied fields, from the automobile to the home automation through the robotics. The program includes meetings with Japanese investors but also China, Taiwan and South Korea. In addition to its booth on the IoT hall where all participants will discover the robot, the BUDDY Team will participate in multiple sessions, including a pitch on October 18th at 11:45 am (Conference Room 104, International Conference Hall 1F) and match-making with industrialists, local distributors and public bodies.